Those Turbulent Sons of Freedom is an interesting lesson in not only Vermont history but American history in that, while we learned in school about the cold winter at Valley Forge in Pennsylvania and the shots fired at the rude bridge in Concord, Massachusetts, often overlooked is the American Revolution being saved in 1777 in Bennington and subsequently Vermont becoming the fourteenth state in the union over a decade later. The author mostly focuses on three main characters; Ethan Allen, Seth Warner and Justus Sherwood. While Allen spent most of the revolution in New York City, Warner was a key figure in battles from Fort Ticonderoga to Bennington, while Sherwood fought colonists in New York and Vermont until the war ended. The book describes in detail, battles that raged around the Lake Champlain area about a month before the more written-about battles started in Massachusetts. Allen was hired by the Connecticut colony to capture (and conquered) Fort Ticonderoga, Britain’s southern outpost on Lake Champlain. He then moved north to occupy Canada, but his attempt to overtake Montreal failed and Allen was ultimately captured and sent to prison in England. By the time he was exchanged for a Scottish officer and freed in 1778, Allen had missed nearly the entire Revolutionary War. While war continued in Brooklyn, Boston, Trenton and Valley Forge, the British had temporarily controlled Fort Ticonderoga, Historic Mount Independence in Orwell, Vermont and the shores of Lake Champlain. However, after crusading though Castleton and Hubbarton Vermont, towards their pursuit of Albany, the plan was halted at Bennington by Seth Warner and the Green Mountain Boys. The surrender of England’s General Burgoyne was a turning point in securing the northeast and allowing Washington to concentrate on the Atlantic states. Wren researches and depicts the events in Vermont after a peace treaty was signed, which officially made the United States a sovereign nation. However, early on, there was question about the territory of the 13 original colonies, especially the area between the Connecticut and Hudson Rivers which is now Vermont. At the time during the Battle of Bennington, several citizens at Windsor had created their own Vermont Constitution as to become an independent nation. Originally called New Connecticut, the territory consisted of land grants given by the New Hampshire Governor to individual citizens, but the New York Governor disputed the validity of the grants and threatened to overtake the land, which nearly derailed Vermont as a state. However, the Green Mountain Boys held their ground against the New Yorkers, and at one point, U.S. Congress even considered following New York’s lead by invading the “new nation” of Vermont. Luckily, however, cooler heads prevailed and the opposition of George Washington ended the potential conflict, which could have seriously jeopardized the solidarity of our fledgling American nation. In 1789 Vermont and New York finally agreed to settle their differences. Vermont paid $30,000 to keep their land claims and the Vermont legislature in Bennington approved of the US Constitution by applying for statehood, which was granted two years later when Vermont officially became a state in 1791. Overall Wren’s book is well-researched, full of detail and descriptive history, and not only describes the early origins of Vermont, but also delves into England’s trials and tribulations as an imperial power during the 18th century. 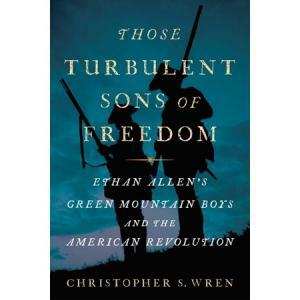 Those Turbulent Sons of Freedom: Ethan Allen’s Green Mountain Boys and the American Revolution is a must-read for all proud Vermonters and history buffs alike.